Ice is frozen water, so why is it really a topic? Think about it – Ice is the one ingredient universal to almost every cocktail made. In my humble opinion, Ice definitely deserves a place in the spotlight – not only in bars, but equally important; in YOUR home-bar. Basically, Ice chills your cocktails but not only that – it becomes a vital part of your crafted cocktail. If you use too little Ice, it will dilute faster and “water down” your cocktail experience – sometimes wanted, often not. I want my cocktails as cold as possible, and with low/slow dilution – I want the same experience from sip number 1 to the last. Dilution shall not be seen as a bad thing, but it needs to be “controlled”. Proper dilution can actually open up some spirits, by emphasizing some aromas and masking others. In the end, Mixology is all about creating balance. Ice is an important key player in this mix! Remember; Ice is a third of your cocktail! There are 4 basic forms of Ice, and if you really want to make some Mixology Magic, it’s important to understand why and when to use the 4 types; Cube, Cracked, Crushed and Block. I use the Cubes when I shake, stir, or use sodas/tonics in my mixes. The larger the Cubes you use in the cocktail itself, the slower it melts thus causes less/slower dilution of your concoction. I mainly use the smaller Cubes in my G&T and highball serves. I often use the big Cubes in my spirit-forward cocktails, such as the Manhattan or Vieux Carré. This to keep the cocktail experience chilled for longer, but also to enhance the balance in the concoction, creating further dilution as required. With large Cubes you can keep the cocktail temperature and dilution consistent for a larger period of time, so you don’t have to rush. Do remember whenever you stir or shake you also dilute the cocktail itself. The longer your shake or stir, the more you dilute. Size does matter; If you shake/stir with smaller cubes, you will dilute it more than if you use larger cubes. If you want an easy method of making crushed ice, simply use a clean towel and a hammer and crush the cubes. This is not only an easy method to use, it can also be quite therapeutic. When you want to make a frozen cocktail, use Cracked Ice (smaller than Ice Cubes). This will not clog your blender as with the bigger Cubes. Keep in mind though, that Cracked Ice melts faster and dilutes your cocktails. Once again, the more Ice you use, the slower the dilution. I mainly use Cracked Ice for Frozen Daiquiris or Margaritas. Crushed (shaved) Ice is very fine Ice that you normally will find in the fountain soda machine at your favourite Fast Food restaurant. Use this type of ice when you want to make snow cone cocktails. Great for warm Summer days, but in my eyes more “fun” than a complex “cocktail experience”. 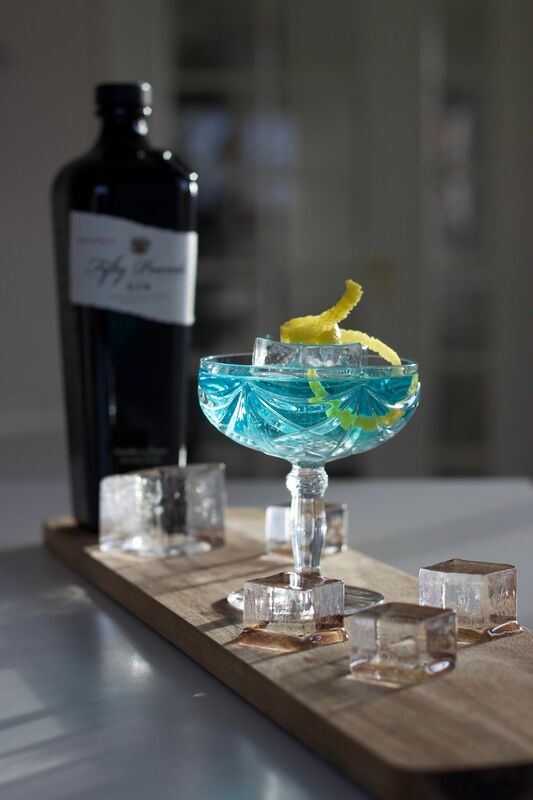 Some cocktail bars use large Blocks of ice to create smaller, usable ice blocks for cocktail crafting’s. This is rarely seen in the home-bars purely due to the practicalities and space limitations. Yes, they look awesome, but in my opinion, using large Ice Cubes works just as fine, and with the same benefits. There is Ice and then there is Clear Ice. After I have started to use the Ice box from dICE, which creates crystal clear Ice Cubes right in my own small freezer, I never use “normal” cloudy Ice in my cocktails. I have started to see Ice as a vital part of the cocktail experience itself. The whole cocktail experience includes the important visual part, and clear Ice definitely have more visual appeal than your “normal” cloudy Ice. Once again remember, that Ice is a third of a cocktail. Simply by using distilled, purified, spring or bottled water, you are way ahead in the Ice game. If you use unfiltered tap water, you get that cloudy Ice and, in the end, a lesser cocktail experience. Another way to make your own Clear Ice is to fill a large Igloo or similar cooler in your large freezer and leave the top off. The water will freeze from the top down only, since the sides are insulated. That way, only the bottom 25 percent or so of the cooler will remain cloudy. You can also buy your Ice. But once again, taste the Ice before use. Being one third of the cocktail, the Ice should not be the ingredients that ruins your hard work and, in the end, the whole cocktail experience. I wish you all great Iced Cocktail Experiences. Where can you drink Fifty Pounds? Maybe it's because I'm a Londoner... Where to drink Fifty Pounds in the capital.